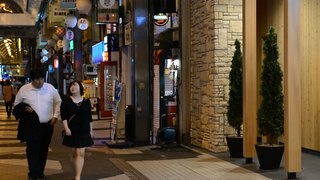 Two down-and-out foodies meet for the first time and embark on an all night dining adventure through Sapporo, Japan in search of self-acceptance and love. Justin Ambrosino is a graduate of the American Film Institute, New York Foundation of the Arts Fellow, Sapporo Artist-in-Residence and a Kyoto Filmmaker Lab Fellow. As a writer-director-producer, Ambrosino’s highlights include the short film,“The 8th Samurai”, which qualified for the Oscars in 2009, "Hungry for Love", shot in Japan, which won the Grand Prix at the Shaded View on Fashion Film Festival in 2016, presented by president Jean Paul Gaultier, and his current short film, "First Samurai in New York," which is touring festivals worldwide in 2018. Ambrosino has also volunteered at the Ghetto Film School in the Bronx as well as the AFI / White House Student Film Festival as a mentor. Read the full Q&APBS spoke with Writer, Director and Producer Justin Ambrosino about how his life experience with food and loved ones has inspired his films. My family and I battled diabetes, heart attacks, weight gain and extreme loss. For a period, I questioned my passion, but in the end, I couldn’t shake my love of all things food-related. My inspiration grew and stories came to me – revolving around food. With this story, I'm not interested in preaching life lessons about food consumption, nor do I judge my characters on how they behave. Instead, I wanted to explore a different side of the food/health issue by showing what it means to have a true passion for eating and finding someone who understands that. We all need that special someone who lets us love in abundance. Operating out of the Riley Broadcast center in Wixom, Michigan, Detroit Public TV publically serves the nation's 11th largest television market. DPTV hopes for a community that people trust public media to facilitate new ideas, make decisions and enjoy enriched lives. DPTV provides local programming that airs culture, art, news and educational outreach campaigns that use the power of media to provide knowledge and understanding.